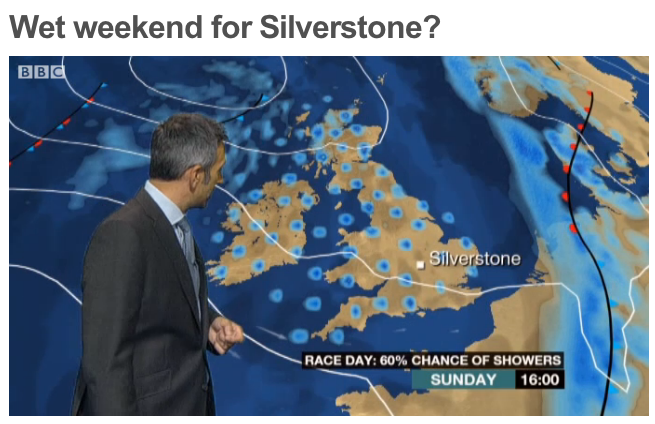 I was checking out the weather forecast for the Formula 1 qualifying sessions and race day at Silverstone. The BBC has a special forecast dedicated to the race on the sports page, which is very handy. But I did have to look twice when I saw the prediction for Sunday. Now look closely at the picture I added. Those rain showers. Somebody just had a laugh in the digital map room and put some random dots over the British Isles, didn't they. It looks like chickenpox erupted all over.